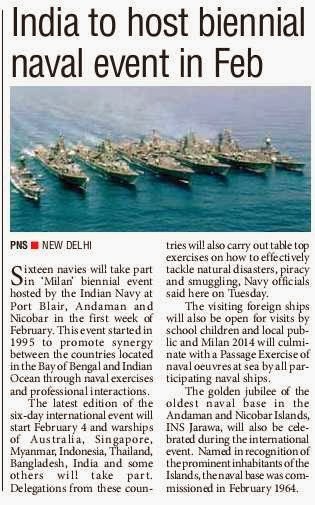 In what will be the biggest-ever military exercise hosted by India, 16 foreign countries will participate in the Naval exercise “Milan-2014” off the coast of Andaman and Nicobar Islands. 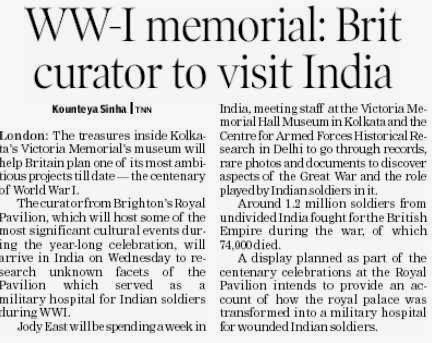 The 17th country will be India. 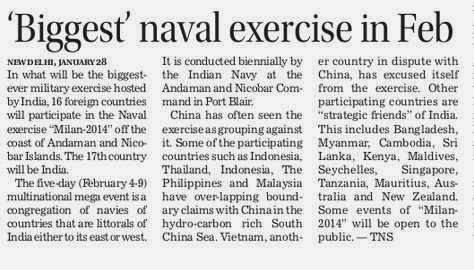 The five-day (February 4-9) multinational mega event is a congregation of navies of countries that are littorals of India either to its east or west. 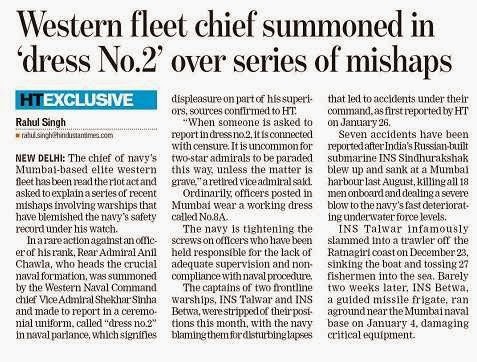 It is conducted biennially by the Indian Navy at the Andaman and Nicobar Command in Port Blair. Defence Research and Development Organisation will test the “containerised” version of Agni-5 intercontinental ballistic missile later this year, with user trials by the armed forces scheduled for the end of the next year. DRDO’s Director General, Missiles and Strategic Systems, Dr VG Sekaran told The Tribune during his visit here that three more developmental phase trials of the Agni-5 are required to validate the design configuration and new technologies, before user trials commence by the end of 2015. User trials, he said, are as good as handing over the missile system for induction, implying that Agni-5, India’s longest range nuclear armed missile that has hit targets 5,000 kms away, could be operational in about two years’ time. Agni-5 would be road or rail mobile and will be stored in and launched from a hermetically sealed canister made of special steel that preserves the missile for several years. SRINAGAR — Indian Army and Air Force Tuesday held a meeting in Udhampur region for improving coordination between the forces in tackling security situations in Kashmir. The meeting was held at at Northern Command headquarters in Udhampur on Tuesday. "A high-level Army-Air Force Staff Officers interaction was held at Northern Command headquarters from January 27-28 to improve inter services cooperation in Jammu and Kashmir," a defence spokesman said. Delhi and Moscow are working to reach a deal under which Russia would supply some military hardware to Kabul for which the payment would be made by India. India and Russia are holding talks for meeting the defence requirements of Afghanistan where the security situation is likely deteriorate in the aftermath of US troop pullout from the war-torn country this year. Delhi and Moscow are working to reach a deal under which Russia would supply some military hardware to Kabul for which the payment would be made by India. Afghan President Hamid Karzai had made a request to Indian Prime Minister Manmohan Singh for supplying military equipments to Kabul during his last official visit to lndia in order to improve its defence capabilities to meet the security challenges following planned NATO troops’ withdrawal. Kabul wants the transfer of these military equipments for its armed forces under the strategic partnership agreement signed with India. 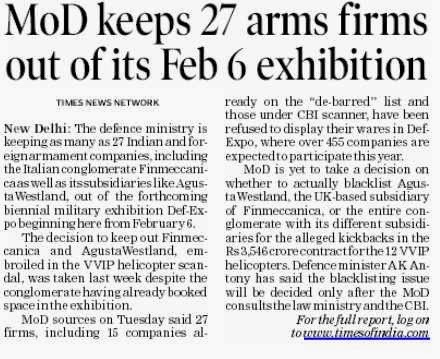 However, India, the world’s largest arms importer, has its arsenal largely equipped with weaponries of Soviet and Russian origin. India cannot re-export Russian made weapons to a third country under an existing bilateral agreement .That is why Delhi and Moscow are working for an understanding under which Russia-made military hardware would be supplied to Kabul for which Delhi would foot the bill. Some of the Russian-made arms can be re-exported to Kabul under concurrence from Moscow. Afghan security teams have visited India with their wish-list and made an assessment of the kind of equipment they need. Kabul apparently has expressed its desire to have battle tanks, field guns, military aircrafts, armoured vehicles and, trucks. The Indo-Afghan negotiations on these issues are believed to be in an advanced stage. Under the Indo-Afghan Strategic Partnership Agreement signed in 2011, India is already providing some military training to Afghan armed forces. Afghanistan is keen to have Russian made military hardware as its armed forces are well-acquainted with Russian weaponries for decades. The USSR and Afghanistan had historically close military ties and the Afghan army was trained and equipped by the Soviets for a long time in the past. That is why the current Afghan government and military leaders have demonstrated their preference for Russian weapons and defence systems. Russia and Afghanistan currently develop their defence ties under a bilateral military-technical cooperation agreement. It is also under discussion to have some weapons sourced from Central Asian countries, whose defence forces are equipped with Russian armaments and military systems . This type of tripartite arrangement facilitating military supplies to Afghanistan is not the first of its kind. Under a deal between Moscow and Washington, Russia has supplied military hardware including military helicopters to Afghanistan for which bills were footed by the US. Even NATO forces have used Russian helicopters in Afghanistan. However, some experts cast doubt that any agreement for this kind of arrangement can be signed unless and until Afghanistan completes the process of inking a bilateral security arrangement with US, which seems to be facing difficulties. Indo-Russian military cooperation in the Afghan direction is not going to be confined to military supplies alone. Both countries are reported to have already taken decision to renovate a Soviet military hardware maintenances facility in the suburbs of Kabul. Both the strategic partners, having strong stakes in Afghanistan are extremely concerned that the security situation in the country might worsen in the aftermath of withdrawal of International Security Assistance Force (ISAF) and believe that the pull out is being conducted in a hurry. Though India and Russia have close affinity of views on Afghan issue, they seem to differ in their assessment of planned US military presence in Afghanistan in the form of a military base. Russia is completely opposed to the idea of a foreign military presence in Afghanistan without a UN mandate. India and Russia are concerned about Taliban staging a comeback to the country. The Taliban–led Afghanistan in late 1990s was a breeding ground of international terrorism that had caused huge problems for India in Kashmir and for Russia in Chechnya .Obviously they would not like a situation in which the Taliban would recapture power in Afghanistan. In the back drop of attempts for having negotiations with the Taliban abroad, both countries strongly advocate that the peace and reconciliation process in Afghanistan should be exclusively Afghan-led and Afghan-owned. HYDERABAD: After the recent heartburn with Israeli counterparts in the Long Range Surface-to-Air Missile (LR SAM) and Medium Range Surface-to-Air Missile (MR-SAM) joint ventures which has resulted in delay of delivery in both these cases, Defence Research and Development Organisation, the premier defence research establishment in the country, is finding another of its major project, the Main Battle Tank Arjun Mk-II, hanging in the balance. DRDO is attributing the delay to the unsatisfactory functioning of some Israeli components, the major amongst these being the Laser Homing Attack (LAHAT) Missile. According to official sources, almost 55 to 60% of the components and major part of the technology in Arjun Mk-II MBT are imported starting from the design to engine and the engine transmission system, gun barrel, computer-controlled integrated fire control system, the tracks, the suspension, and the Muzzle Reference System etc. The German engine of Arjun Mk-I has again been integrated in Mk-II despite claims of an indigenous engine, as per the sources. When contacted, officials attributed this adjustment to the small order and that a separate plant for manufacturing engines cannot come up for such a restricted order. Sources revealed that Arjun Mk-II has a long way to go before being accepted by the Indian Army. DRDO had recently launched its Arjun Mk-II for user trials in Rajasthan after integrating the same with almost 75-80 improved features including 16 major technologies as sought by the Indian Army which has already inducted 124 of the Arjun Mk-I tanks. DRDO has been developing Arjun MBT with help of its various labs led by Chennai-based Combat Vehicle Research and Development Establishment (CBRED) while Hyderabad-based Defence Metallurgical Research Laboratory of DRDO has developed the armour for Mk II version of Arjun. The development trials have been on for the past more than two years. Apart from accuracy, smoke emanating from the Israeli LAHAT missile has been an issue of concern with both the developers as well as the users of Arjun Mk-II. "Israeli counterparts have been conveyed the issues and asked to rectify the problems at the earliest," was all Avinash Chander, secretary, defence research and development and director general, DRDO, could say. Arjun Mk-II, the futuristic main battle tank, has been touted as one of the most potent combat tanks for the Army with unmatched automatic target detection and destruction while offering maximum protection to the crew in addition to impressive speed and maneuverability. 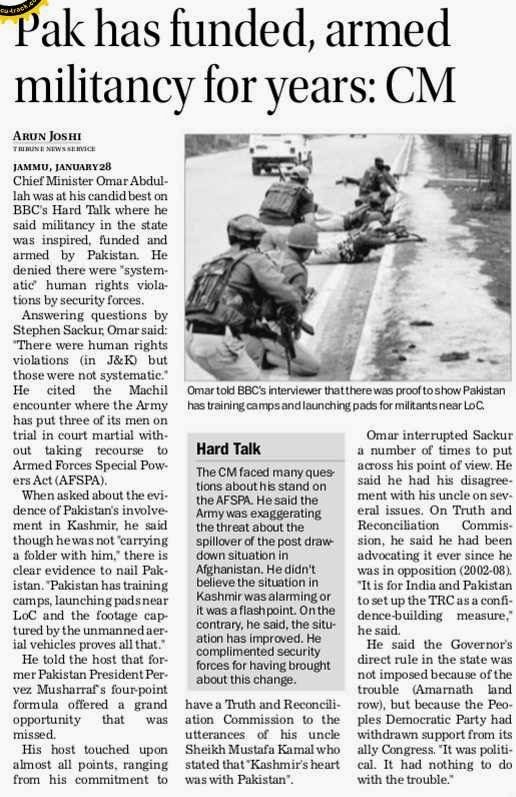 Srinagar: In his first reaction on the 2000 Pathribal encounter case, Jammu and Kashmir Chief Minister Omar Abdullah has flayed the Indian Army, saying that it needs to be "a lot more accommodating". The Army had on Friday closed its probe in the case, acquitting the five accused soldiers, saying the evidence recorded could not establish prime facie charges against any of them. Abdullah said, "The Army has said that they don't have enough to proceed with the court martial. 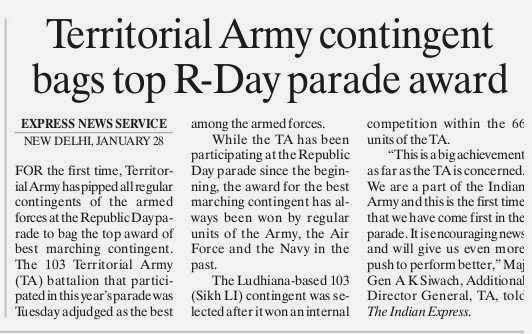 I hope the Government of India recognises the decision of the Army has not gone down well. This is a matter which is currently in front of the Supreme Court as well. The AFSPA argument will come up again. The CBI has found evidence, how can the army say that they cannot accept this?" The CBI had in 2006 indicted the five accused Army personnel - Brig Ajay Saxena, Lt Col Brahendra Pratap Singh, Maj Saurabh Sharma, Maj Amit Saxena and Subedar Idrees Khan - stating that they were involved in the gunning down of five villagers and dubbing them as foreign militants before the media. The investigative agency, in its chargesheet, stated that the killing of the innocents was a result of "tremendous psychological pressure" on the Army to show results after the massacre of 36 Sikhs in Chittisinghpura in the valley on the eve of the visit of then US President Bill Clinton to India. "One Macchil doesn't make everything else fair. All the goodwill the Army has earned has been undone by a Pathribal decision. This is one of the few test cases," the 43-year-old said, referring to the 2010 Macchil fake encounter case for which the Army court-martialed six of its officers. 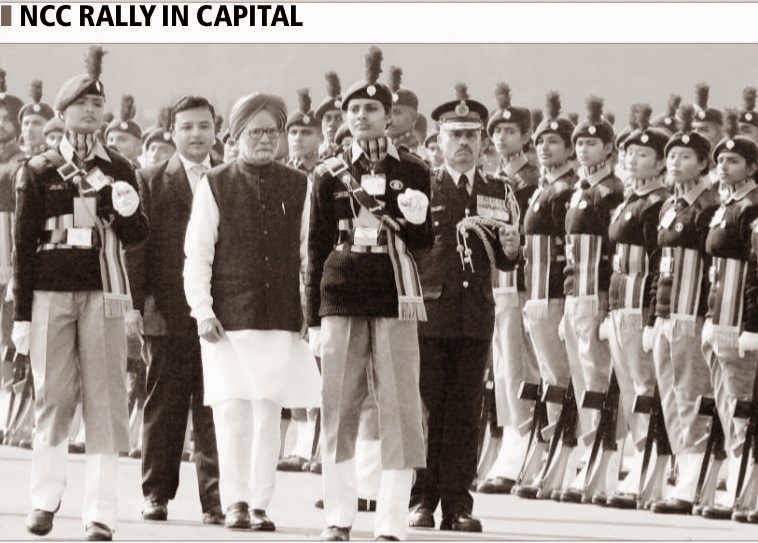 The young Chief Minister also ruled out Arvind Kejriwal-style protests to press for his demands. "Arvind Kejriwal did a dharna outside the Rail Bhawan. What did he end up with? Two policemen go on paid leave? We have to give logic to the government of India. 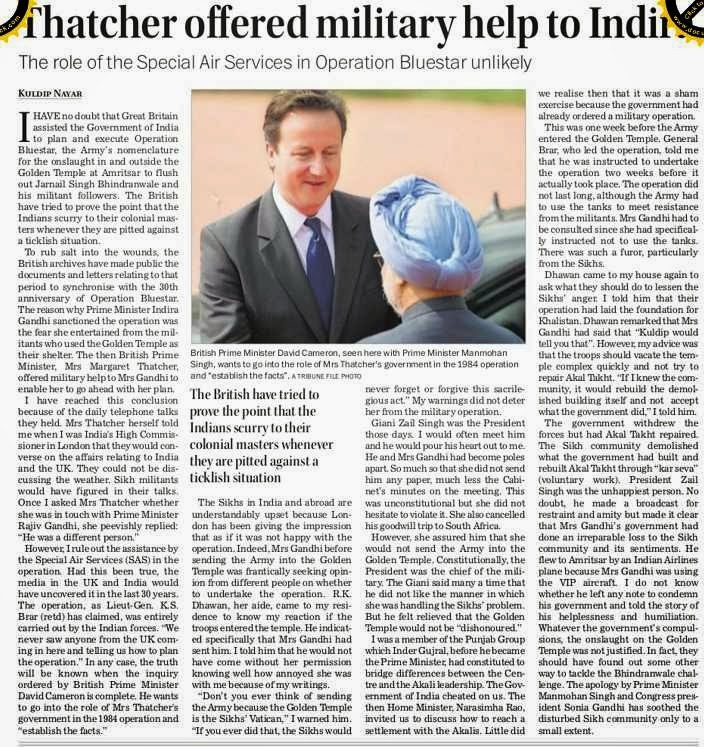 How would you react if any Chief Minister sat outside the Ministry of Defence on the AFSPA? Would you be open to that thought?" he asked. Abdullah also said that the National Conference's alliance with the Congress was "under discussion". "There are reservations in our party. 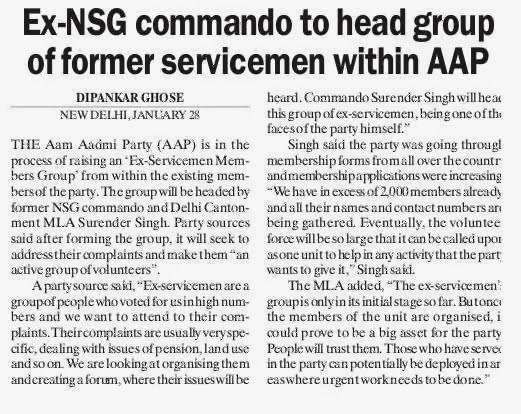 Sections in the Congress too would like to do it alone," he said.